At J. Wrigley Vineyards, romance is rooted as deeply as the vines with owners John and Jody Wrigley igniting the spark on site. “We met in Oregon wine country 11 years ago and had our very first kiss on our property less than 24 hours later,” John said. “It was love at first Pinot, for sure.” Four months later, John proposed at the property surrounded by stumps and brush. The Campbells planted La Bohème in 1985, named it in honor of that special date and their favorite Puccini piece. It must have been fate because Bohème just happened to be the name of the family who first homesteaded the property. 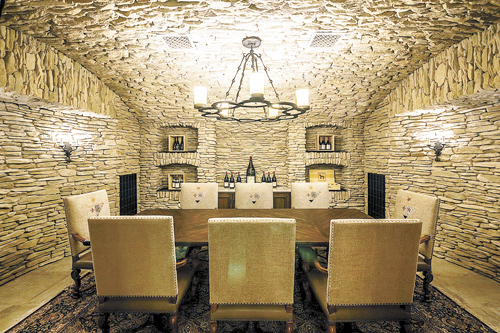 Down limestone stairs and into the Burgundian-inspired cave, couples can find private alcoves for cozy conversations inside the winery’s Clubhouse, where numerous decks and fireplaces upstairs also make for wonderfully romantic opportunities. The cool caves at Archery Summit are the perfect place to steal a kiss; the low arched ceilings, warm glow of the lights against the stone and cellar temps encourage cuddling, too. Proposals on the upper terrace have inspired candle-lit, rose petal-strewn private wine tastings in the heart of the subterranean space. Couples can further celebrate at the winery’s Red Hills Estate Guest House with 270-degree vineyard views, high ceilings and cozy furnishings. 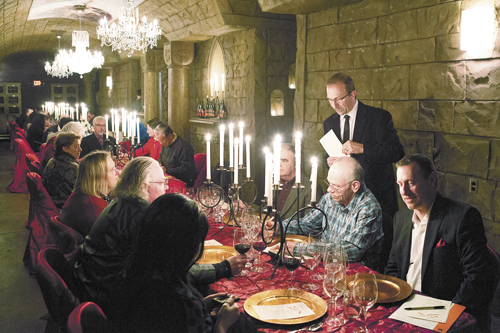 Nearly every part of Reustle-Prayer Rock Vineyards appears designed for a special moment. Stepping on the property is like entering a magical land as the Old World-style architecture and gardens establish a truly romantic atmosphere. Many a marriage proposal has happened at the “Prayer Rock” itself, affording a stunning panorama of the Umpqua Valley. Below in the intimate catacombs, declarations of love have happened, too. Lovers can also reserve the “dock houses" for quiet afternoons on the pond, where swans can be seen in heart formation. 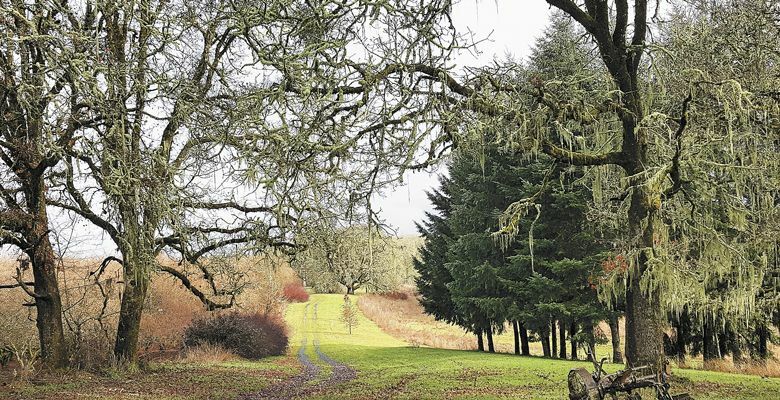 Tyee Wine Cellars sits on a 130-plus-year-old family farm with hushed paths through sturdy moss-covered vines, hazelnut orchards, cathedral oaks, woodlands, ponds and streams. The outdoor spaces are popular for hiking, birdwatching and romantic picnics. A sunny day allows visitors the chance to hike the 1.5-mile Beaver Pond Loop Nature Trail and maybe steal a kiss deep in the shade. Saffron Fields was designed for moments of tranquility. A meandering path leads from the tasting room to a patio overlooking Thales Pond. Guests can sip and stroll through the Zen-style garden among cascading waterfalls and ethereal sculptures. Benches offer places to rest along the path and a modern fire pit with lounge chairs make a for a great spot for a wine country caress. While Biodynamic grapegrowing may not sound romantic, the results can be. 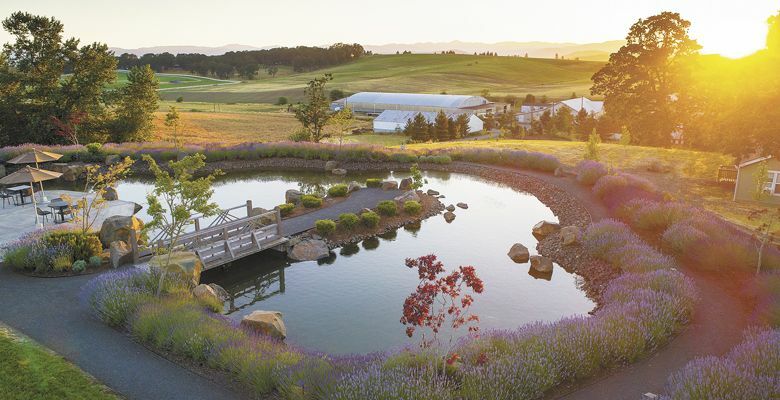 The team at Keeler Estate has built a complete ecosystem to promote healthy soils and vines; this means guests can enjoy a pretty pond with floating ducks while honeybees buzz around landscapes of blackberries, wildflowers and fruit trees. All can be taken in with a glass of wine while wandering the walking path surrounding the water. Take a brief detour across the footbridge for a secret rendezvous under the grand oaks. With more 160 acres of hiking trails teeming with wildlife, Delfino offers the privacy and grandeur some couples seek for a special day, and night. The winery’s cozy guest cottage features a canoe-ready pond, perfect for watching the sun set behind the spectacular Callahan Mountains. Upon waking, breakfast awaits in your room. The billowing willow tree at White Rose Estate remains a favorite for marriage proposals. Standing under the tree lends a new meaning to the phrase “as far as the eye can see.” A clear day offers views of Mount Hood, Mount Jefferson and two of the Sisters. 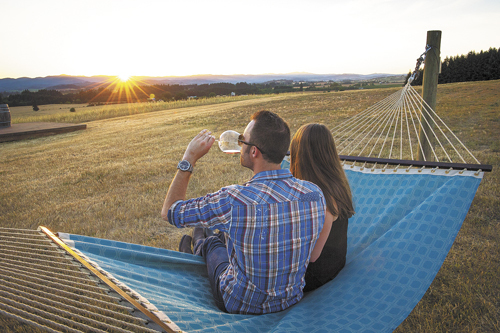 The 500-acre landscape of Left Coast Cellars represents a labor of love and a perfect place for lovers. 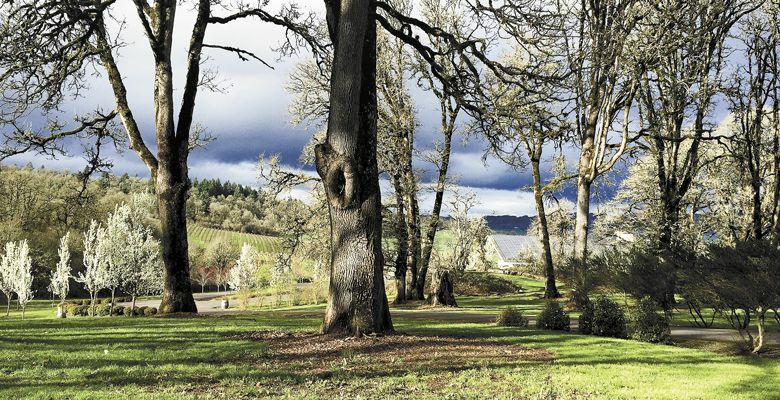 The beauty of the estate inspired the family to move to Oregon. 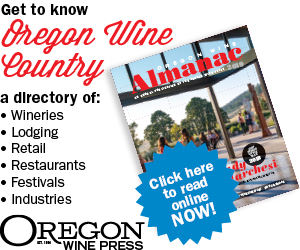 Cultivated gardens, fields of wildflowers, meticulously tended vines and a hundred acres of old-growth Oregon White Oak create a nature-filled retreat. Plan an entire date with a visit to the café for wood-fired pizza and other light fare. For a really special moment, take your lover on a vineyard tour, ending above the wine cave with a panoramic view of the vineyards and lake; then plant the smooch. 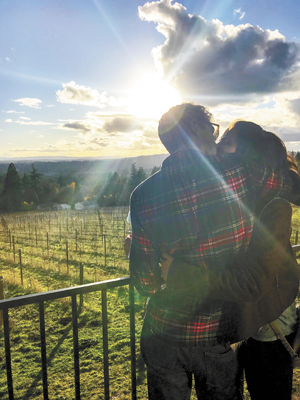 Time spent at Youngberg Hill in McMinnville makes nearly everyone a hopeless romantic. Surrounded by vines, the inn — offering well-appointed rooms with fireplaces, Jacuzzis and a wine country breakfast — captures views that seemingly never end. Couples can while away an afternoon gazing at mountain peaks on the wrap-around deck expansive enough for cozying up with a glass removed from other guests. Owners Wayne and Nicolette Bailey relish adding subtle touches making special moments even more memorable. Red Ridge Farms delights the senses. Visit the gift shop and pamper your skin with a lavender-infused lotion. Touch your lips with the tangy tastes of an assortment of olive oils; then wander outside to gaze at the olive trees and lavender, where the scents will linger in your memory. 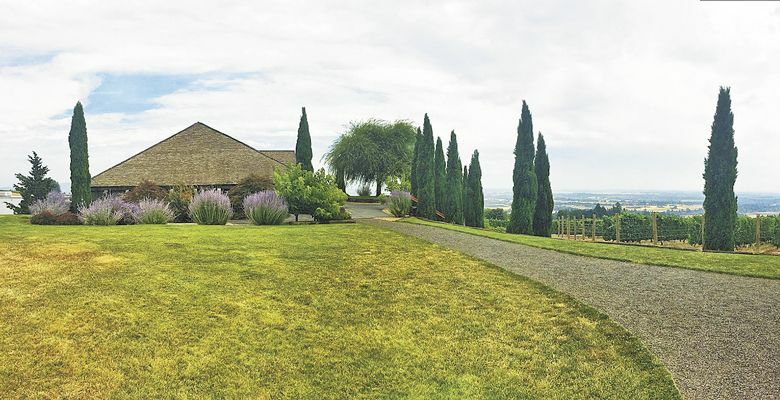 After tasting through a flight of Durant Vineyards estate wines, retire to the Garden Suite. 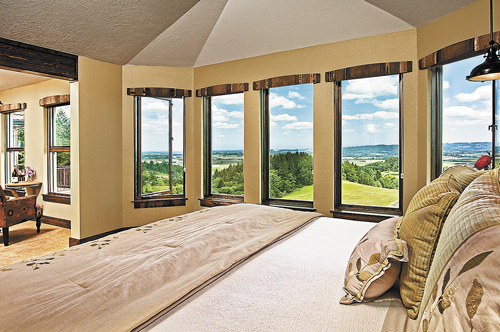 Enjoy incredible vineyard views, rustic wood beams and luxurious linens. 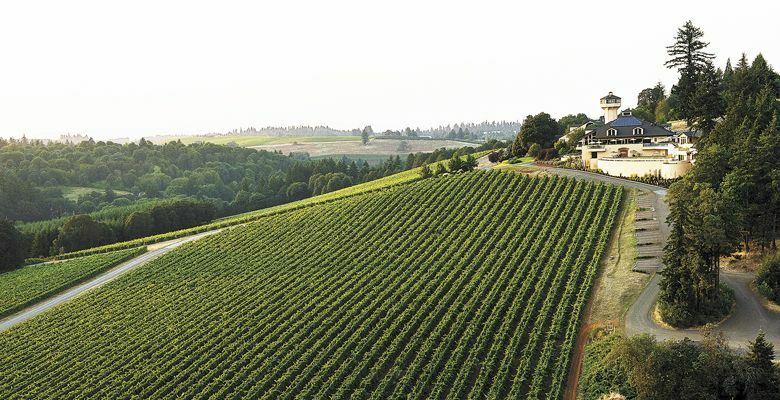 For the quintessential Willamette Valley luxury resort experience, The Allison Inn & Spa is unsurpassed. Two words: couple’s massage. Stay the night and have plenty of time to snuggle by the fireplace — found in every room — or share a smooch on a private terrace or by the infinity pool. If you are in love enough to share dessert, order the decadent dark chocolate Pinot Noir cake from Jory Restaurant. If you’ve been married a while, maybe order two. Anne Amie has it all: premium wine, art, decks, views, gardens and hammocks. Head there for a sip and a peck. “Couples have always been drawn to the tire swing tree and usually head there hand-in-hand,” said Stoller’s Vic Panichkul. 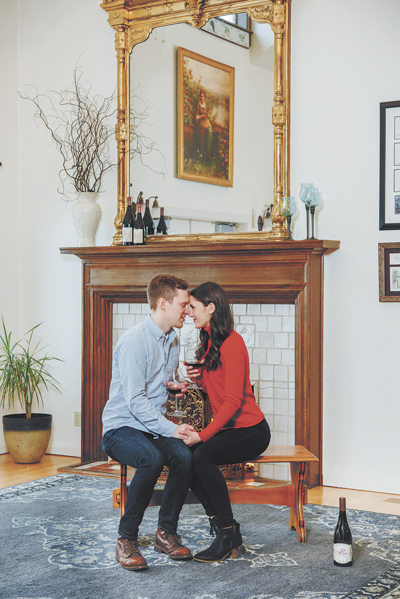 Just far enough away from the tasting room to feel a little secluded, it has become a popular spot for proposals; in his one and a half years at the winery, he’s already helped plan 20. An engineer once told owner David Polite how the old Carlton Hill barn would make a great fire. Good thing he didn’t listen. Instead, Polite restored it in 1996, transforming the structure into a whimsically rustic spot, lending charm to many weddings and anniversaries over the years. Polite says, “It seems a century-old barn brings out the best in us.” Tastings are private and by appointment only, perfect for the more intimate experience. Spend an afternoon inside or out in front of Soléna Estate’s intimate fireplaces. The crackling flames and handcrafted wines provide the perfect atmosphere for quiet conversations and togetherness. Ruby Vineyard includes a cozy tasting room with a fireplace and a clear view of Mount Hood. The adjoining vineyard, right in front of where you park when visiting Ruby, was planted in 1973, and its gentle slope is a perfect place to capture a kiss. Ruby is also the 40th anniversary gemstone, and many couples make their way to the winery to celebrate their happy union. 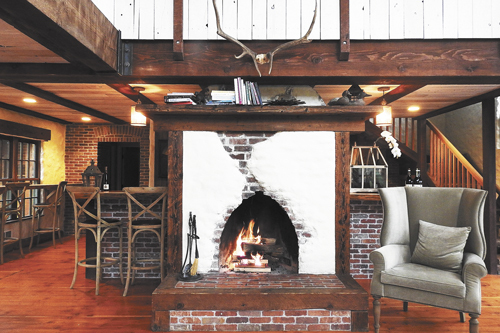 The beautiful stone fireplace is a romantic finishing touch in their recently opened tasting room. 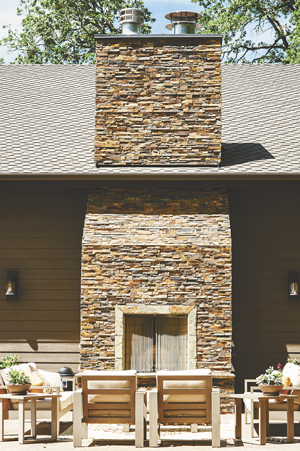 The craftsmanship is a reminder that Mark Björnson’s skill as a stonemason helped pay for his college education and his wooing of wife Pattie. 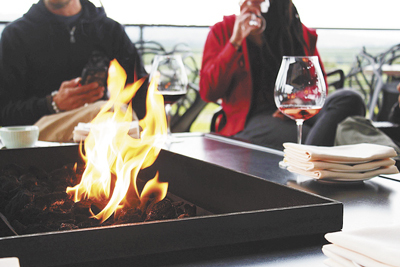 Enjoy a wine-soaked sunset warmed by the fire table on Ponzi Vineyard’s covered terrace. Or sink into a loveseat fireside while taking in the vineyard landscape through Ponzi’s windows designed for the view. Enjoy Colene Clemens’ warm, cozy setting. The slower pace of the season creates the opportunity to spend an afternoon sipping wine, warming up next to the flames and enjoying an intimate conversation cuddled up in oversized leather chairs. Built by Antiquum Farm owners Stephen and Niki Hagen along with Stephen’s dad, the little cottage was constructed with love — the couple had just been married — using beams from a decrepit house on the property in the weathered-looking fireplace and some of the siding for the ceilings in the nearby tasting room. The cottage was intentionally designed to create a series of small areas where guests enjoy a sense of solitude in a cozy, quiet, charming setting, perfect for a peck or two. Planning an engagement or special occasion? Talk to Bruno Corneaux, owner/vintner at Domaine Divio, to add a little French flair. He describes an engagement last year that started a tradition. “I have decided to offer to sign and date a bottle for couples who want to get engaged at our winery.” Corneaux fuels his fireplace with 40-year-old Dundee Hills vine stocks; he has enough for at least two years. What are you waiting for? 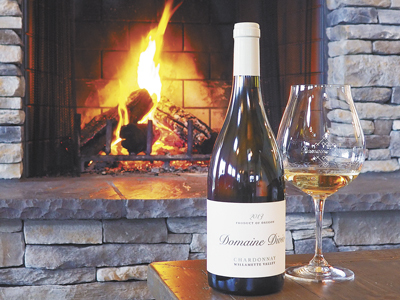 Cuddle when warmed by the fireplace for a rustic-chic wine country experience. Or pretend you are on a faraway trip. The 35-year-old olive trees from an Italian clone allow the imaginative to close their eyes and pretend they are in Italy. 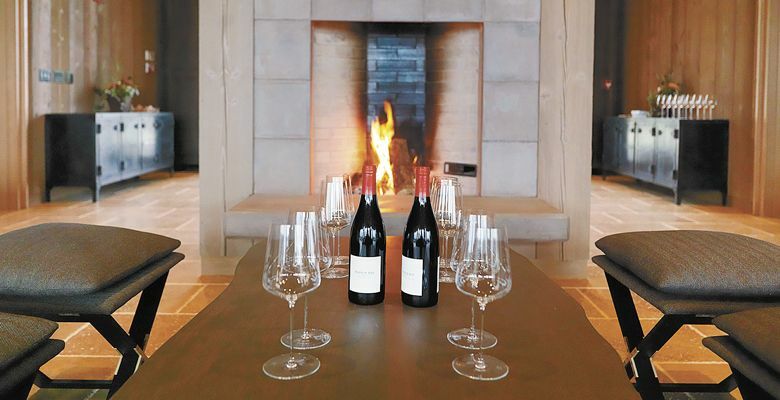 What many call the “sexiest tasting room in Oregon,” the estate tasting room at Willamette Valley Vineyards hits all the marks: piano music, warming fire, amazing views, decadent food, fabulous lodging. But it is the “iconic” tower that seals the deal. With a 360-degree view, the backdrop to your kiss can include the Cascade Mountains and the Coastal Range with rolling vineyards in the mix. Even on a busy day, this spot feels quiet and secluded. Sweethearts rush up with a conspiring giggle and drift back down with telltale grins and sometimes new rings — it has long been a location for wedding proposals. 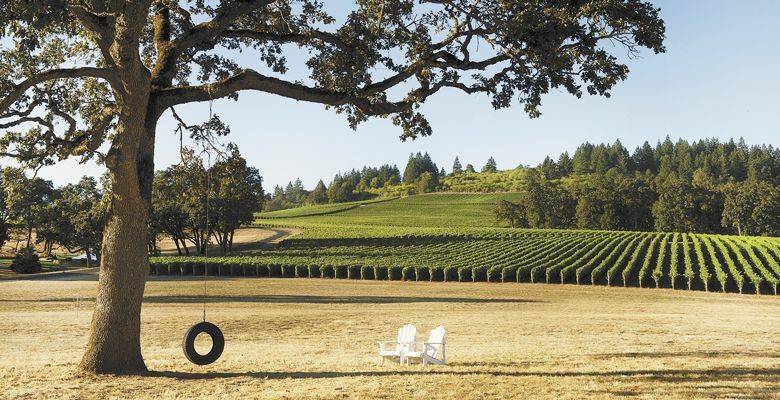 Nestled within an 80-acre forest, Fairsing Vineyard is distinguished by exquisite estate-grown wines, inspired hospitality and sweeping panoramic views of the Valley. Enjoy both the beauty and bounty of Fairsing, from generous exterior patios, intimate seating areas and cozy fireplaces. Stroll the enchanting labyrinth and drink in majestic vistas showcasing peaks from the Cascades to the Coast Range. 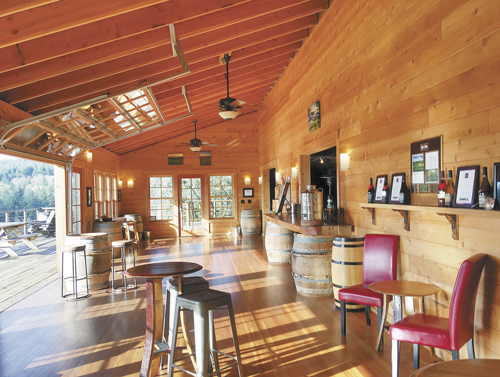 The tasting room at Maryhill Winery definitely strikes an impressive chord. Stepping through the doors, guests are immediately greeted by Mount Hood framed in the west windows. Cozy chairs and a fireplace in the main room add to the comfy atmosphere. Tasting in the more intimate Reserve Room includes samples of library wines and a private patio with views of the majestic Columbia Gorge. Outside, the grounds are a great spot for a picnic or to walk your furry friends along for the romantic ride.